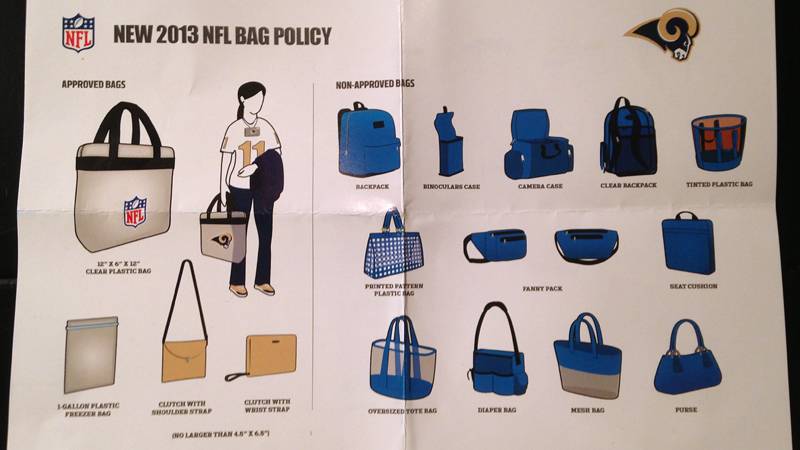 Sarah Spain received this "Bag Ban" pamphlet with her tickets to the Nov. 23 Bears/Rams game in St. Louis. This Sunday, thousands of NFL fans who (smartly) skipped their team's preseason games will head out to their home stadium for the first time this year. For many of them, especially folks who don't spend much time on sports blogs or engage in social media, the new NFL "bag ban" will be a very rude surprise. The guidelines sound clear enough (pun intended), but news cameras have already caught security guards turning away women who had what appeared to be compliant "hand-sized" clutches. After years of bringing their handbag or blanket-stuffed weekender to games, many female fans will find themselves trudging back to their cars on Sundays, tossing purses into the back seat and shoving wallets, glasses, lip gloss and cameras into the tiny little pockets of their skinny jeans. Leave that seat cushion at home, Grandma! 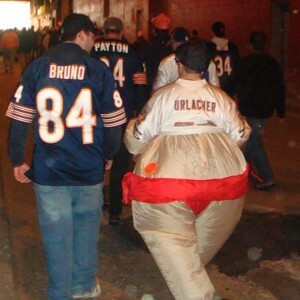 The NFL doesn't care if you've got a bad hip! Lady, that "I Will Outdrink All You Hos" flask is visible in your clear tote, I'm afraid you can't bring it in. You'll just have to spend $11 on a watered-down Mai Tai at the one-mixed-drink stand 14 sections from your seat. Please remove those Super Plus Plus Gigantor tampons from the socks you've hidden them in. If you want to bring them into the game, EVERYONE must see them. And you, ma'am, taking your kids to their first football game? Sorry, we've confiscated your expensive, multi-pocketed diaper bag. Here's a plastic freezer bag for your diapers, bottle, blankets, snacks, toys, antibacterial wipes, EpiPens, inhalers, mittens, extra layers, keys, wallet and iPhone. Oh, and that pricy camera? You're no longer allowed to bring in a camera case. Hope that Ziploc baggie keeps the lens scratch-free. Almost makes you want to stay home and watch the game on your couch, with every purse and bag you own piled up around you like a leather, suede and cotton monument to freedom and privacy. But then you'd miss tailgating with your friends and cheering on your team and high-fiving strangers and heckling your opponent and overpaying for bad beer. 1. Wear a giant foam finger and prove that your "hand-sized" purse is, indeed, hand-sized. 2. Wrap your unmentionables (a.k.a. BOOZE) in wrapping paper and ribbon. Tell security they are presents for your "schmoops" and he can't open them 'til, like, the fifth minute of halftime, which is the exact moment of your one-month anniversary, which is totes not a stupid thing to celebrate, especially since no one has ever loved you like he does! Stop judging! 6. Fill a soft, cotton purse with all of your essentials (beer, "hard drugs") and tuck it under your shirt. Hold your purse-belly and waddle like a pregnant woman. Dare the security guy to a) Ask if you're pregnant, and/or b) Ask to pat down your pregnant belly. 8. Tie everything to a string and wear it around your neck. Camera, lip gloss, keys, phone, glasses, sunscreen, hand-warmers, wallet, Tylenol (for the neck ache). Everything you need right at your fingertips! 9. Wear a babydoll dress, lace-trimmed bike shorts and Doc Martens so your outfit screams "1995!" as much as your plastic purse does. 10. Put the dangerous weapons and explosives you always bring to NFL games in your "lady parts." (Remember that "Curb Your Enthusiasm"/cell phone episode?!) As long as you don't have a clear, plastic uterus, they won't see a thing.